Post-Truth American needs it's own founding mythology, a story of origin. Indeed, to understand a given population, we profit from looking at their "myths of origin." As one (intentionally nameless) sociologist has explained, these stylized stories of venerated ancestors are not really about historical events, but rather they express a given society's "most basic self-conceptions." 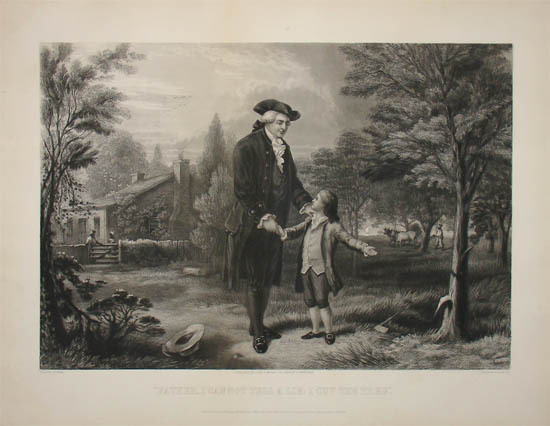 So how about this one for Post-Truth America: A young George Washington receives a new hatchet and cuts down his father's cherry tree. When confronted by his (angry) father, the youthful future general and president boldly accepts responsibility for the act, proclaiming, "I cannot tell a lie." You've heard this one, right? You probably also know that it's complete fiction. It came from the imagination of Mason Locke Weems. One year after Washington's death, Weems published a biography that would become an instant bestseller. By the book's fifth edition in 1806, he decided to include the story of the cherry tree. As historian Jay Richardson explains, "A Federalist admirer of order and self-discipline, Weems wanted to present Washington as the perfect role model, especially for young Americans." To summarize, then, this is a story about the virtue of truth, which also happens to be completely false. Certainly it had a purpose in the nineteenth century when it was published. But for our purposes today, it fits seamlessly with the motto of the age: "Why let facts get in the way of a good story?" I would love to tell you that I came up with this insight all by myself--that the cherry tree myth can now be seen as an ironic metaphor for the "Post-Truth Era." But as with most things, I'm pilfering this from a really good podcast that I just listened to. I have praised the CBC show Ideas With Paul Kennedy before, and this morning they dropped yet another timely and thoughtful episode called, "The Truth about 'Post-Truth'." The featured voices all, in their own way, express dissatisfaction with the label of "post-truth." I confess that I find it to be a rather lazy term. Those using it often neglect the much longer history of similar behavior wherein people have given privilege to emotion and conspiracy theories, rather than facts and reason. At the same time, though, the interviewees adeptly diagnose the uniqueness of our current situation, particularly in light of the promises and perils of globalization. Below is the show description. Give it a listen... because there is absolutely nothing else of significance happening today. Nothing. The election of Donald Trump has ignited talk that we're now living in a "post-truth" era. But are we? Where does the idea that the truth no longer exists come from? Or the notion that the truth doesn't matter anymore? Host Paul Kennedy talks to thinkers who argue that the story began years earlier, with a kind of collective identity crisis: authoritarianism can become attractive when you no longer remember who you are. "'Post-truth' is often understood as involving people's emotions rather than their critical abilities to make distinctions. And I think that might be true but i think it's important to keep in mind that emotion and truth are not two different things. Emotion has to do with what we care about and truths have to do with things that are the case. The two have to work together." -- Kathleen Higgins​People from all over are asking the question: how did we get here? In a world where technological advances spread to the masses at astonishing speed; in a time when we can be instantly connected to one another; in an era when information can travel around the globe in a flash, have we become less concerned with the verifiability of what we believe as long as it conforms to our point of view? And if the truth is atomized to the point where I can have my truth and you can have yours, then how can any of us actually have a conversation? Without a basic set of assumptions about what's true, we have no starting point for the debates we engage in. But maybe this is simply, as they say, the "new normal" -- that when it comes to the truth, where you stand depends on where you sit.